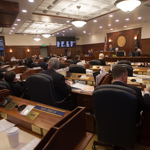 Juneau – Today, the Alaska House of Representatives took a step towards returning to the tradition of allowing lawmakers from different parties and caucuses to jointly sponsor bills and resolutions. House Bill 41 reinstates a long-time practice of allowing members to work together as lead sponsors of important legislation. “Significant legislative solutions are rarely if ever accomplished by one lawmaker or one party. It has been my experience that the best solutions are the result of teamwork with colleagues from across the aisle. Allowing the joint sponsorship of bills is a small, but I believe significant, step to allow members of the House and Senate from different parties, regions, and backgrounds to work together on real solutions,” said HB 41 sponsor Rep. Les Gara (D-Anchorage). Currently, only one person is allowed to be a prime sponsor of a bill that many might have a strong interest in sponsoring. “It’s good to share credit for good legislation and not keep it for yourself,” said Rep. Gara. House Bill 41 passed the Alaska House of Representatives today by a vote of 26-12. The bill will be sent to the Alaska State Senate for consideration. For more information, please contact Rep. Les Gara at (907) 250-0106.